Coppell sophomore midfielder Jocelyn Alonzo takes a goal during the match against Irving at Buddy Echols Field on Feb. 5. The Cowgirls won, 4-0. Last night, the Coppell girls soccer team defeated Irving, 4-0, in District 6-6A action at Buddy Echols Field. Three of the goals were scored during the first half. The first came from sophomore midfielder Jocelyn Alonzo with an assist from senior forward Rebecca Watley. The following two were both made by Watley, with assists from senior forward Micayla Watley and junior defender Katie Odum respectively. The only goal of the second half came from junior forward Alyssa Roemer, with an assist from freshman midfielder Bailey Peek. Coppell remains the only team in District 6-6A without a loss at 5-0. 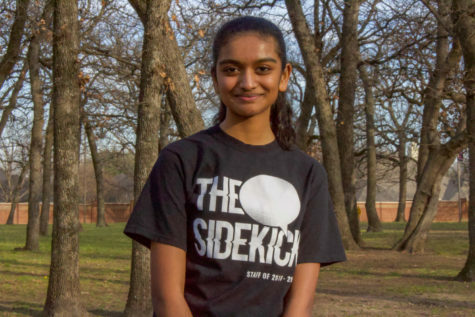 The majority of play took place in Lady Tiger territory, with the Coppell offense creating numerous scoring opportunities. The strength of that offense, however, also highlighted their weakness, as most of the shots that were taken did not make it into the goal. The first half of the match consisted of fast play by the Cowgirls. 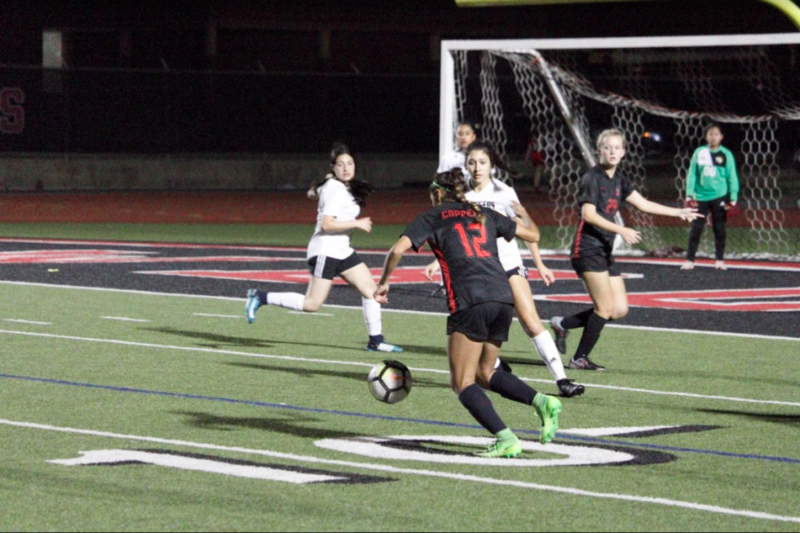 Despite a series of shots hitting the goal post, soaring over the bar and missing the goal altogether, Coppell found enough offensive strength to pull off a 3-0 score by halftime. The second half had more plays by the defense, as Irving were able to enter Cowgirl territory more. The Lady Tigers had a few scoring opportunities, most notably a free kick that ended up in the arms of junior goalie Lauren Kellett. Both teams had their share of free kicks that night, though none of them resulted in goals. The beginning of the match before the kick off, where players are introduced and take a moment to high-five their teammates and coaches, was different this time. For teacher appreciation, each player was allowed to choose a teacher. That teacher would accompany the player during their introduction in the beginning and following run through the team and coach. Selected teachers ranged from AP U.S. history teacher Kevin Casey to CHS9 geometry teacher James Behlen. The teachers then went to the press box for snacks as the match began. 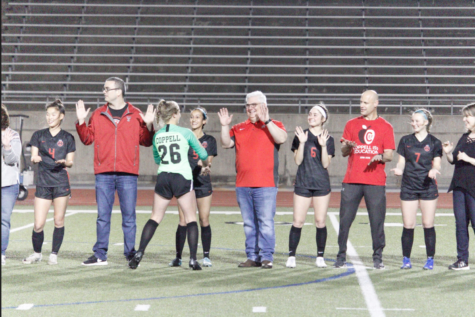 The Coppell girls soccer players and teachers celebrate Teacher Appreciation NIght on Tuesday at Buddy Echols Field. The Cowgirls won, 4-0, over Irving. The Cowgirls play at Flower Mound at 7:30 p.m. on Friday.